Judy Reith Rozelle is not only passionate about conducting grape trials and research, but also about helping people throughout Wisconsin successfully start their own vineyards. In fact, she runs a small business to help new grape growers choose the most viable varieties to plant. “I think people who start working in grapes really love it because you are out there and you are doing so much hands-on work, and then when the grapes start to ripen, it’s so beautiful. You walk down the vineyard and see all these different varieties,” said Reith. Her passion for grape-growing is what earned her the award of the Wisconsin Grape Growers Association Industry Person of the Year. “When the winner of the Industry Person of the Year was announced at the wine and food pairing dinner at the Wisconsin Fruit and Vegetable Growers conference, I was really stunned. I had no inkling that my name had been submitted for consideration. I was truly honored to be selected by a group of people so hard working and dedicated to the grape and wine industry in Wisconsin,” recalled Reith. In Wisconsin, there are about 90 wineries, 100 people who grow grapes either for personal use or to sell to wineries and at farmers markets and 1,000 acres of grapes. The West Madison Agricultural Research Station, where Reith fully retired from her position as assistant superintendent in February 2013, has 12 table grape varieties growing in a small vineyard that were planted in 2007. Originally 15 varieties were planted but some were not compatible with Wisconsin growing conditions. From 2007, when the table grapes were initially planted, to 2012, when they started producing abundantly, Reith and her colleagues were able to collect plenty of helpful information to determine what varieties perform the best in Wisconsin. Factors that impact what varieties will succeed include winter hardiness, disease and insect resistance, fruit quality and ripening time required. “It was a really great learning experience,” said Reith. Reith and her colleagues will use their newfound research to further assist people who are joining the industry in deciding how to best get started. “I just think it’s an industry that is going to grow. All the focus was on the wine grapes in the beginning because it’s so romantic. People want to own wineries. There was not much research on table grapes so people did not want to put any in,” said Reith. The 12 seedless table grape varieties thriving at the Research Station include Canadice, Einset, Reliance, Somerset Seedless, Vanessa, Himrod, Interlaken, Lakemont, Marquis, Mars, Trollhaugen and Venus. These are all rose-colored, green or purple grapes. They vary in size, are all winter-hardy and are resistant to diseases and insects. Each has its own unique flavor and spiciness. “That project started as a trial because people did not believe that we could grow table grapes in Wisconsin, so it was really hard to get the support from some campus and extension staff,” said Reith. 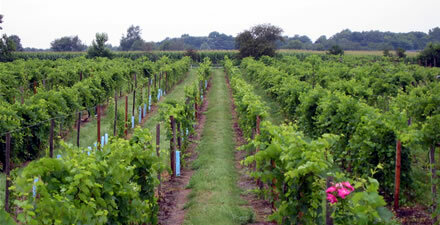 In 2010, four new seedless table grape varieties were planted. They include Montreal Blue, Suffolk Red, Thomcord and Jupiter. Thomcord is a cross between Thompson and Concord and has survived 3 years. Montreal Blue is popular in Canada, but it originated from Elmer Swenson, a breeder in Wisconsin in the 1960s. Swenson bred and produced some of the highest quality grapes that are still being used today. “That is why I am really excited about Montreal Blue, it has Wisconsin roots,” said Judy. There also is a particularly appealing newer white wine grape growing now called Brianna that can be sold as a table grape with a few seeds. “It’s so tasty that we have to watch it when we are out harvesting for data collection because we like it so much we start eating it. It’s really spicy and full of juice. When you bite into it, it’s so good!” said Reith. Read the rest of the story via Wisconsin’s grape industry continues to gain momentum.